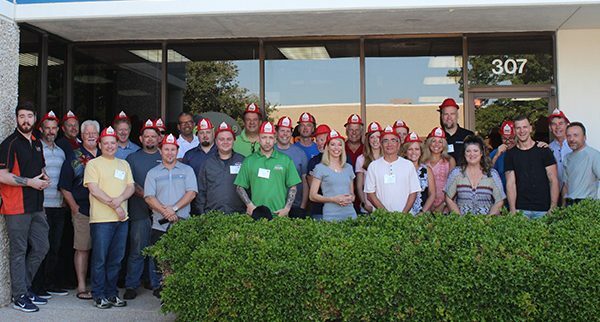 In May, InstaFloor North America held a two day training course for its distributors at IFNA House, its Dallas headquarters. The program covered all aspects of the use of CLL, its liquid lino floor covering line, new to the American market, and InstaLay, its flooring installation system. CLL, a true linoleum, that is a liquid applied, seamless, self-levelling, resilient floor covering made from a blend of sustainable natural products, making it an extremely environmentally friendly product. InstaLay, the unique, self-adhesive, acoustic underlay, manufactured from recycled rubber crumb, which provides a quick, clean installation and saves significant time and money. On completion of the course, all attendees received their ID badge of certification and are now registered with IFNA for three years. Additional training will be provided as necessary and further full courses will also be held for distributors’ staff. After providing much positive feedback, this first group of 28 trained staff will now act as the distributors’ ‘first responders’ to any questions flooring contractors may have about InstaFloor’s products. To signify this, in addition to their ID badges, each one was presented with a firefighter’s helmet.